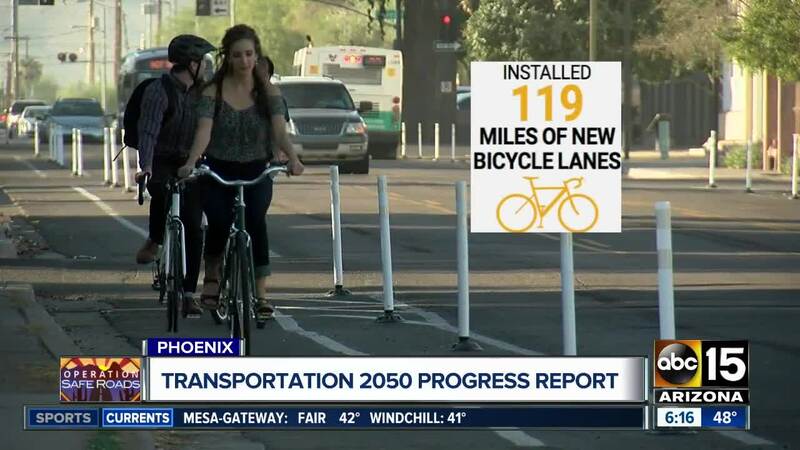 Whether you travel by car, bus, bike, or your own two feet, the city of Phoenix says they want a safer, more connected commute for you. They are attempting to do that through the Transportation 2050 project with improvement plans laid out over the next few decades. This was approved by voters back in 2015 and started the very next year with a sales tax, along with federal and regional funding. PHOENIX — Whether you travel by car, bus, bike, or your own two feet, the city of Phoenix says they want a safer, more connected commute for you. They are attempting to do that through the Transportation 2050 project with improvement plans laid out over the next few decades. This was approved by voters back in 2015 and started the very next year with a sales tax, along with federal and regional funding. 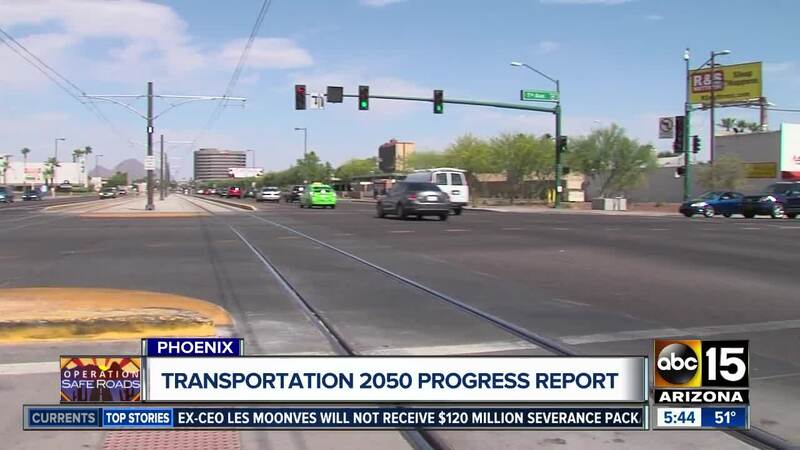 "It's a 35-year transportation plan... multi-mobile and it's about $16.7 billion worth of local tax dollars that we'll come into over the 35-year program," Phoenix Street Transportation Kini Knudson. "It's divided between light rail, bus, and streets," Knudson went on to explain. Knudson walked ABC15 through the latest progress report since the program started two and a half years ago. Some examples of progress you can see now before 2050 include more than 100 miles of bike lanes that are now ready for riding. "When we install those bicycle lanes, we're looking at a connected network across the city," Knudson said. "We're looking for where people will feel safe riding their bicycle." They have also added 15 miles of new sidewalks and more than 5,000 ADA ramps. Frequency has also been increased for a handful of bus routes and more routes have been added. Plus, you may also notice 100 shade structures in place across the city at bus stops to keep riders safe in our scorching summers. These updates were paved out with a specific plan. But, Knudson said the city is also staying open to changes to the path based on the community's needs. "We live in a world where we need to be flexible and adaptable to the changes that are happening because of economic conditions, what's happening with development, what's happening with... just around the city," Knudson said. In fact, last week the Phoenix City Council voted unanimously to start the process of accelerating some funds for the Pavement Maintenance Program. "We're doing our best to make sure that we're using those funds wisely throughout the 35 years, but something that's been very on the fore-front of council and the public is the condition of our roadways," Knudson said. That decision by the council will make $200 million available to fix some of the city's roadways. The money will be used for 600 street miles to be repaved in the next five years. City officials said the T 2050 program is built around your feedback. If you would like to give comments about improving your commute, click here .